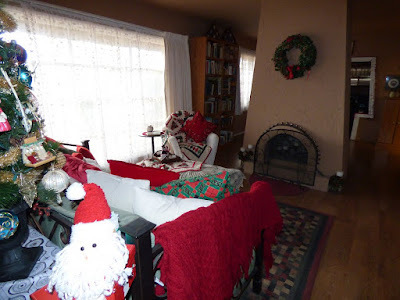 Yes, the decorations have been up for almost a week now, and it's time that I shared them with you. As I've mentioned in the recent past, it's "Christmas Lite" this year compared to previous years. I'm finding that my interests in decorating for the holidays is turning from lights and trees to the "soft furnishings" end of the spectrum. Now it's time to take you on a tour.... Just left click on any of the photos, and a new window will automatically open so you can see all the photos in their original sizes. As the years pass, we get fewer and fewer Christmas cards in the mail. I used to put them all in a big wire wreath on the wall. 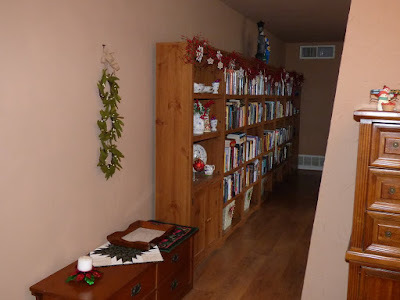 Now we don't receive enough to cover the wreath, so I'm just setting what we do get on top of the short bookcases in our office. Fewer cards for you, too? 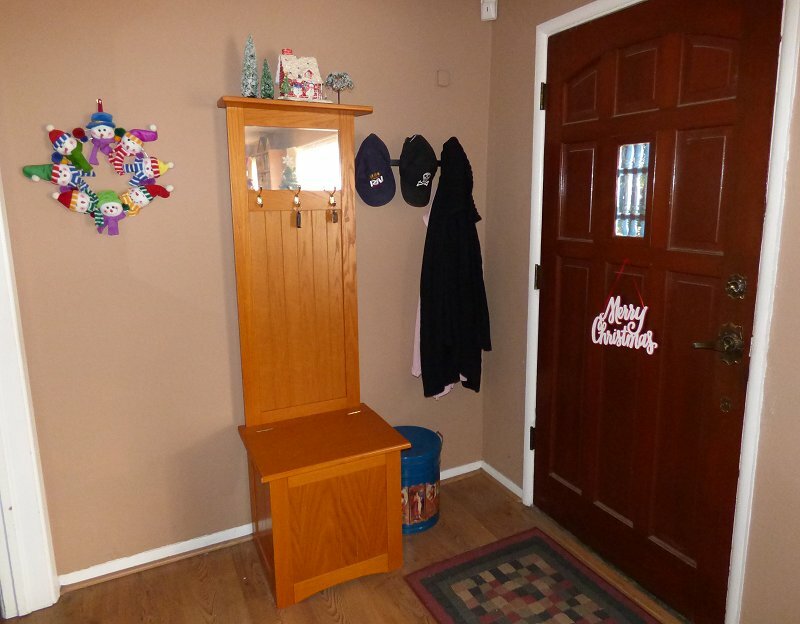 Here's the entryway. 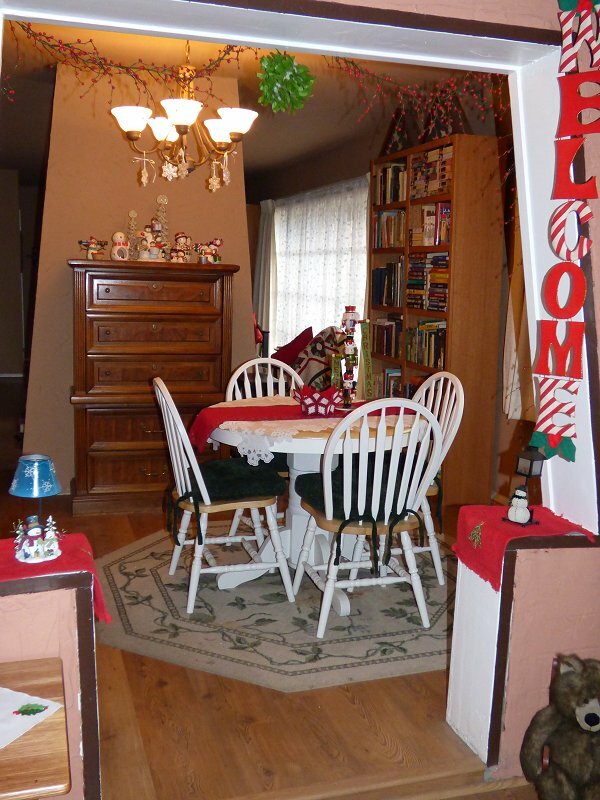 "Merry Christmas" on the door, a candle-holding Christmas house and trees on top of the mirrored bench, and a snowman wreath that hangs where the card wreath used to. 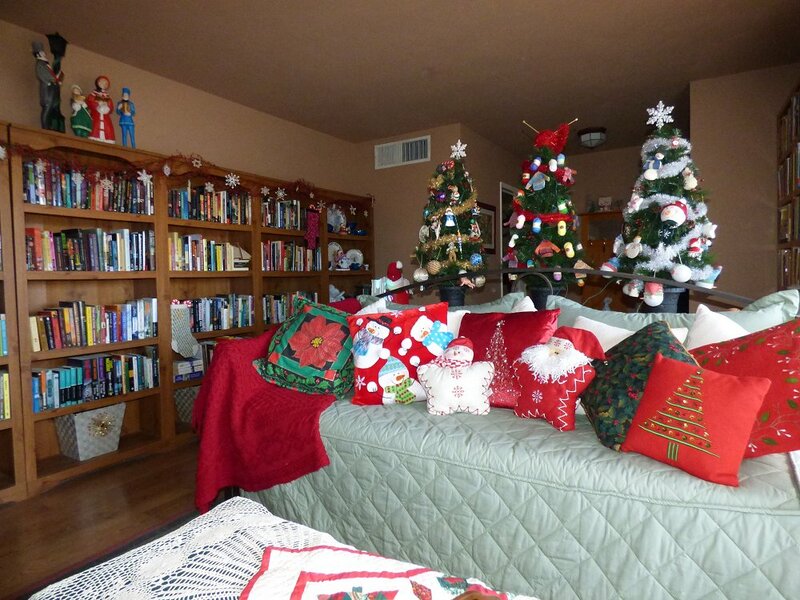 The only three trees in the living room-- and a partial display of Christmas pottery. 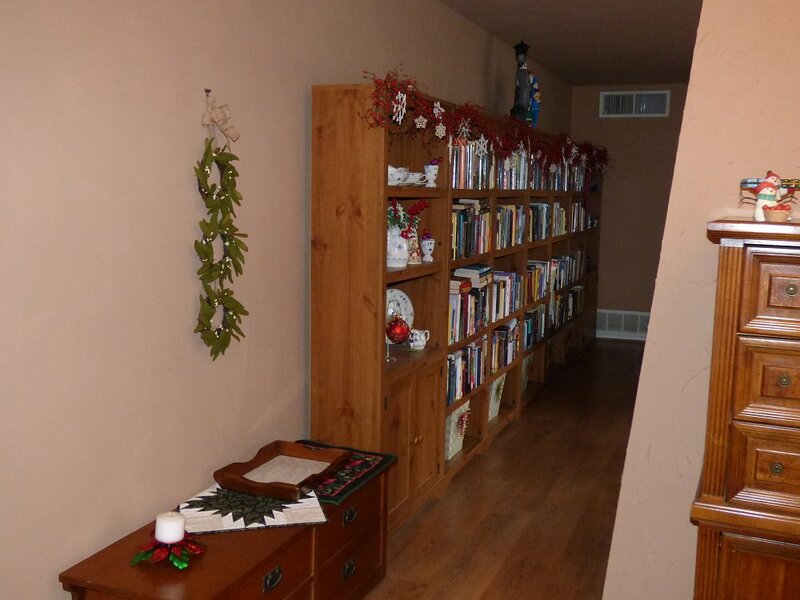 That run of bookcases to the right are my to-be-read shelves. 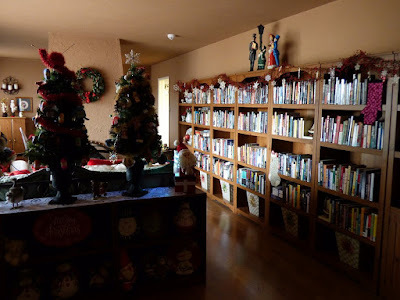 A simple red berry garland decorated with crocheted and tatted snowflakes runs across the top of my to-be-read shelves, which are crowned with the set of carolers my mother made back in the 1960s. 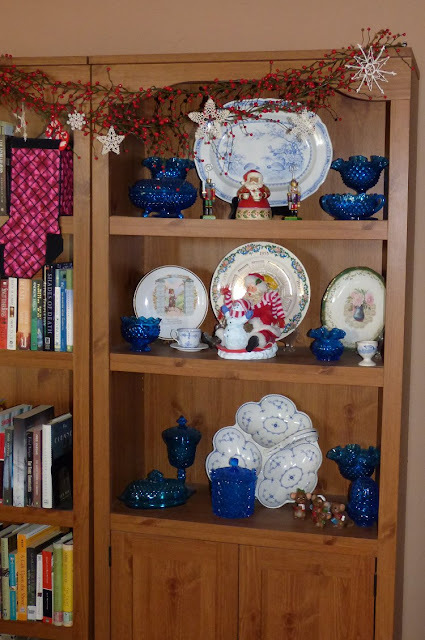 If you've noticed two "stockings" sitting on the shelves, those are items that I needlepointed. The part that actually sits on the shelf behind the "stocking" can hold small gifts and candy canes. 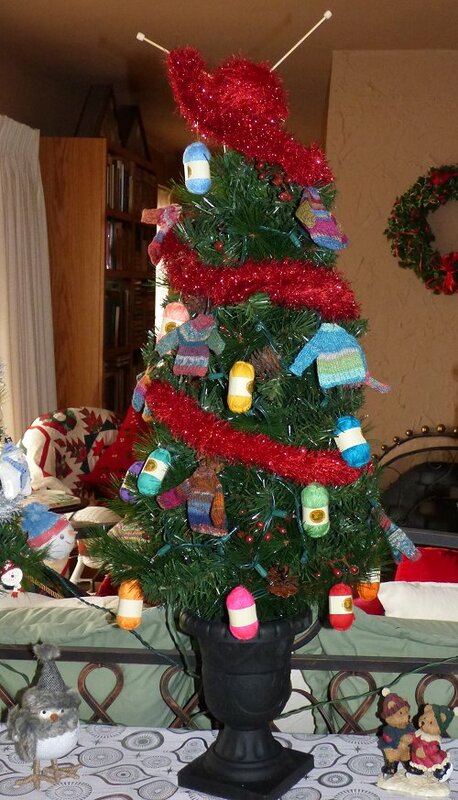 The snowman tree with a garland knitted in silver eyelash yarn. One of the snowmen wears a sombrero and is playing a guitar. When you press a button, you hear my favorite Christmas song: Jose Feliciano's "Feliz Navidad." I had to hunt to find that little guy! My knitting tree, complete with ball o' yarn and knitting needles topper and garland knitted in bright red eyelash yarn. Tiny skeins of yarn and handknitted sweaters complete the decorations. Next year I plan to knit mittens or socks for it. Another handknitted-with-gold-eyelash-yarn garland. This tree contains some of my favorite ornaments from the largest tree I used to put up. From the oldest ornaments to three generations of handmade ornaments to the newest-- a Harrods delivery van that came home with me after our September trip to the UK. I've always found ornaments to be one of the best sources of memories. 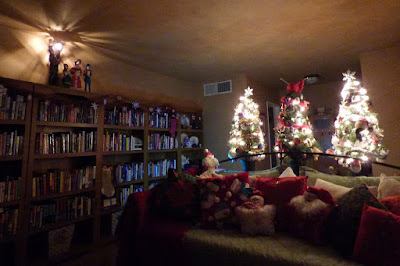 No longer the rest of my Christmas Forest, but another comfy place to sit, read, drink tea, eat cookies, and enjoy the holiday atmosphere. 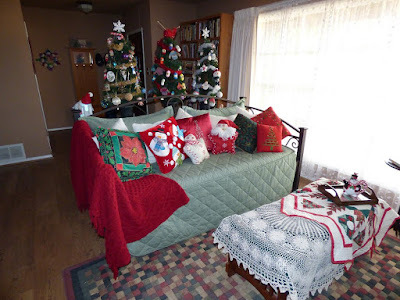 I cannot tell a lie: I love Christmas pillows! 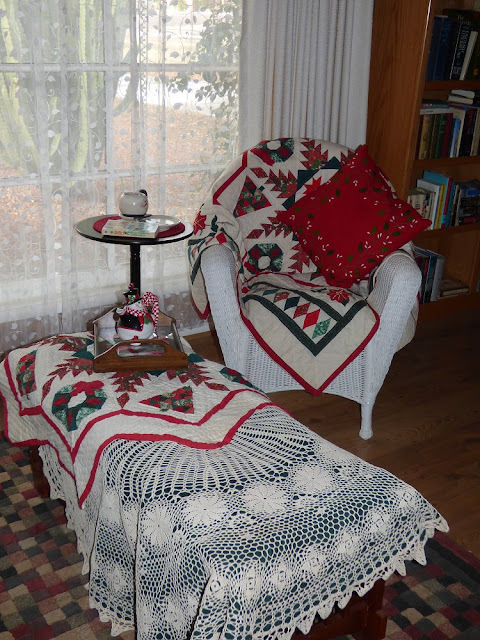 The deep red afghan you see hanging over the side of the daybed is one that my mother made me many years ago. Mom excelled in Irish knit patterns with all those lovely, complicated cables. 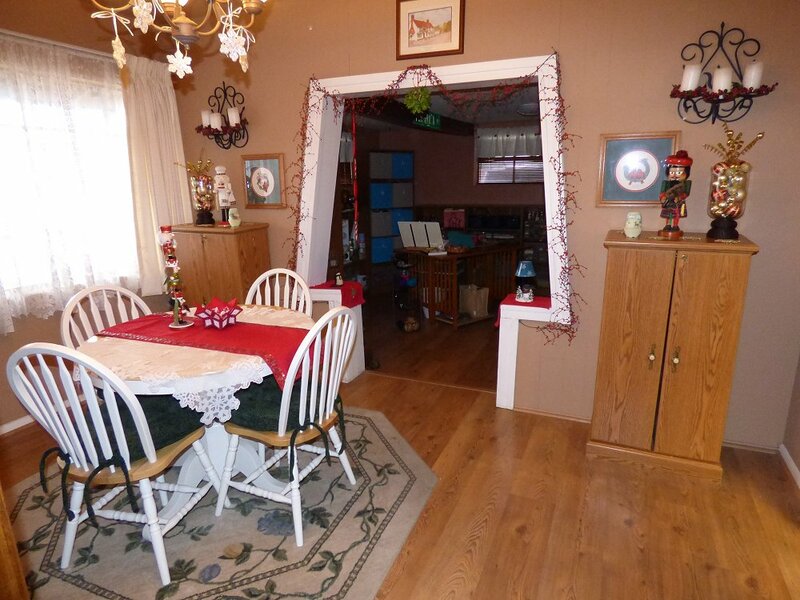 The dining room, in its pared-down style. 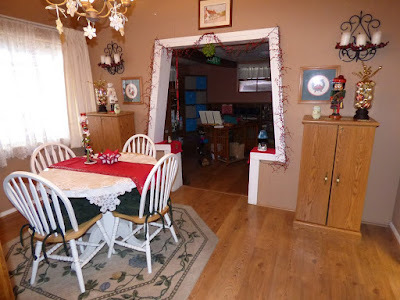 The dining room as seen from my craft room. Looking back at the to-be-read shelves. 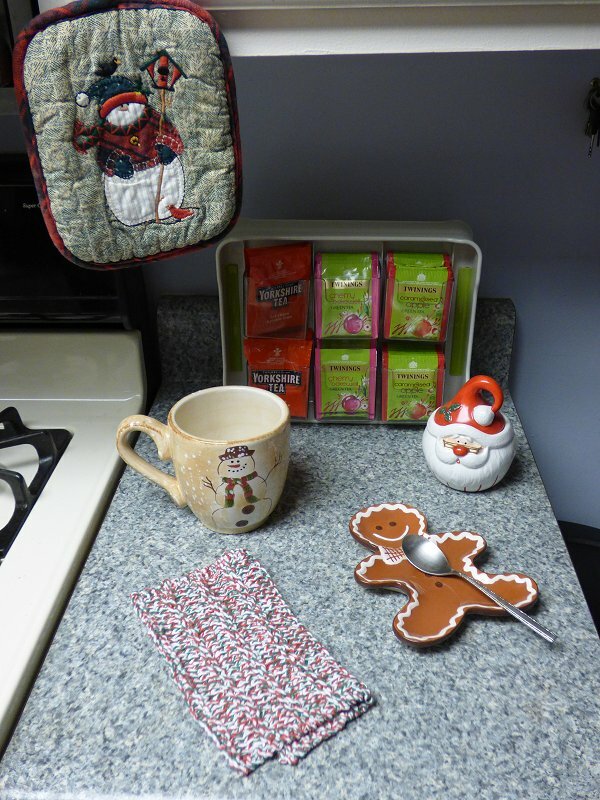 Another needlepoint tray insert, and two quilted pieces made for me by a dear friend in Canada. 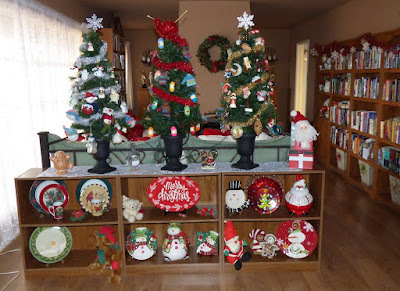 Several friends have made me decorations over the years. It's impossible not to think of them all each time I walk through the house. Looking into the kitchen and family room. Our tea-making station. The electric kettle is on the other side of the stove. In case you're wondering, all the tea you see is ENGLISH tea. American tea is too wimpy for Denis, and I fell in love with Twinings' flavors of green tea when we were in the UK. 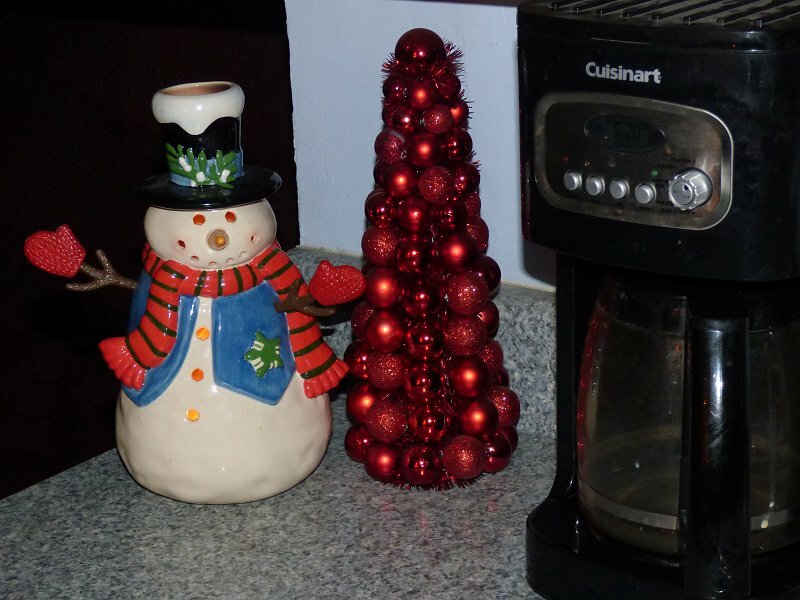 Denis makes coffee to take to work, and my snowman here hides a citrus and clove soy candle inside. 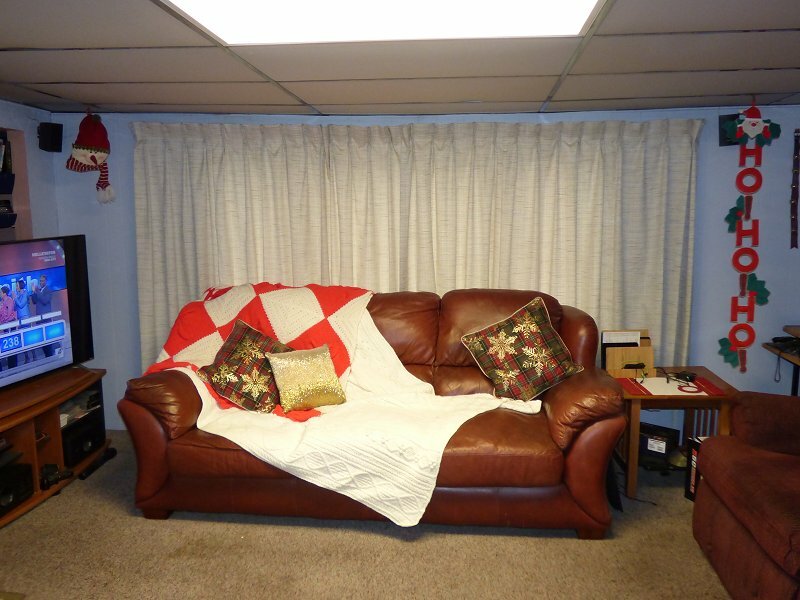 There are two more afghans my mother knitted on the couch. The red and white one was the first one she ever made. It was done in pieces and the pieces sewn together. As soon as one of the blocks was long enough, my puppy would jump in Mom's lap to lay on it and sleep as she knitted. The white afghan is an absolutely gorgeous Irish knit pattern that my mother made for my grandmother. My grandmother carefully wrapped it up and tucked it away in a closet "for best." Best never came. When I went back to get my grandparents' house ready for sale, I found it in the closet. It had never been used. Needless to say, it came home with me! The view from my chair where I sit, knit, and watch television in the evenings. That big white "trash bag" on the other side of the end table is holding the bed coverlet that I'm knitting. The black blob on top is a scarf I'm knitting for a friend. I hope you enjoyed my Christmas Lite Tour. Happy Holidays! Makes you wonder how the greeting card companies are coping. 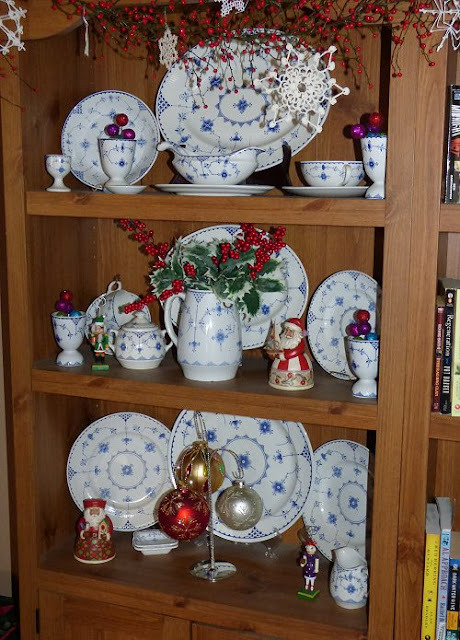 I enjoyed your Christmas tour very much, love your TBR shelves. Wish I could knit, I'm strictly a crocheter. Thanks Cathy for sharing your lovely Christmas decorations. It looks so festive and pretty. 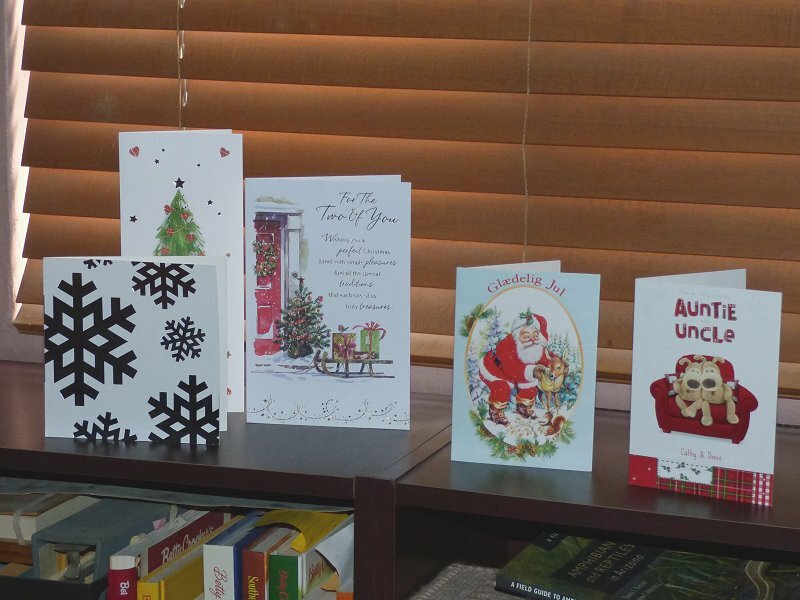 I have been putting off getting my Christmas cards ready to send. I was going to start around 9 AM and it is after 12 o'clock now. So I better get going. Christmas is going to be here soon. 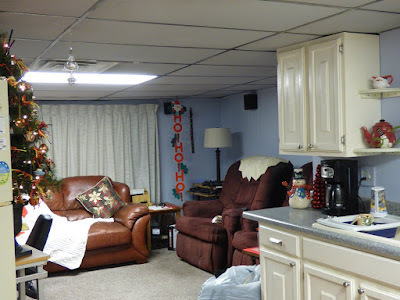 Thanks again for sharing your Christmas decorations and your blog with us. I have found so many new authors to read from your blog. I have a lot still to try on my TBR list too. Ah... thank you, Lynn! Merry Christmas! This is amazing! And it's "Christmas lite!" I like the tree with your favorite ornaments on it. No one I've ever met has done such an elaborate display, and certainly no one in the Big Apple I've ever heard of has done so. Some people with houses in other boroughs do big outdoor displays which I see on the local news, but none exist in my vicinity where there are only apartment buildings, large and small, and brownstones with no front yards. 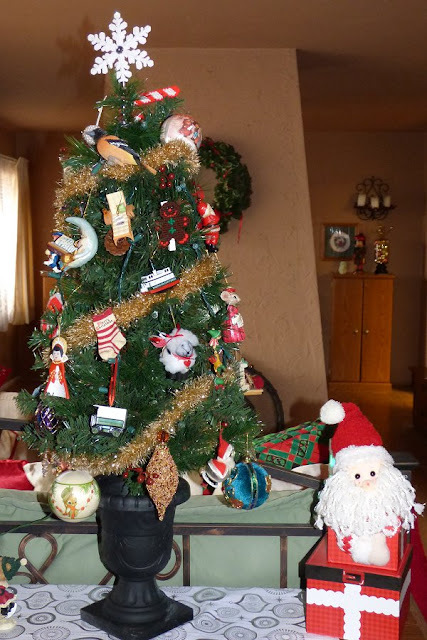 My family, being of dual religious backgrounds, had one tree which we decorated and a menorah. When I moved out, I didn't have either one. 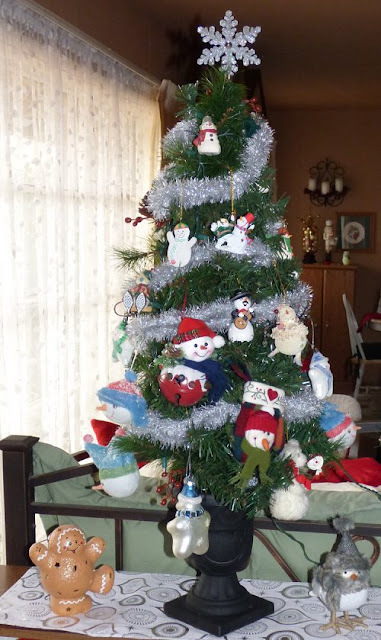 But every year I go to a friend's house for the best meal of the year and help decorate her tree. I always bring her a new ornament or two. And somehow few cards. Everybody celebrates different holidays around here -- Christmas, Chanukkah, Kwanzaa, the Winter Solstice and Eid. So, it's a multicultural month and I enjoy it to the hilt! I'd like to join the druids in celebrating the Winter Solstice if I knew any. It's an important time of the year for so many cultures and beliefs. I, too, love Christmas decorations. If I get a chance I'll photo some and get going back with my blog. 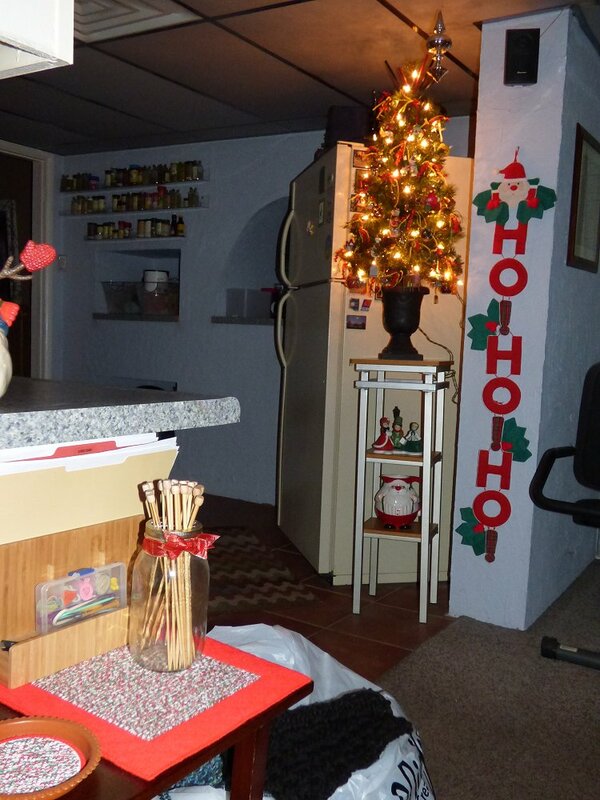 Thanks, Cathy, for the jumpstart of holiday cheer!